I’ve been in the fitness and nutrition space for over six years now and I see it for what it is. Although there’s a lot of great people and information in the industry, it tends to be one of extremes. A lot of change is forced on people that’s fear or guilt based, with answers that are either right or wrong. I knew that there was another way. Coaching is at the heart of who I am. I coached kids in basketball since I was in my teens and then was a personal trainer after that. There’s so much good that can come from a coach who truly cares about you as a person. As much as I’d love to coach each and every one of you, there’s no way that it’s possible for me. As the CEO and founder of FDL, I have too many other commitments and a team that needs me daily. But I still recognize the need for amazing coaches who have a compassionate and balanced approach when it comes to nutrition. That’s why for the last year I sought after and personally mentored two amazing coaches who are primed and ready to transform your life. So although I won’t be the one personally responding to you, please know that I oversee this coaching process, that I know your story, and these coaches are a direct extension of myself. Rest assured, I’ll be along this journey with you, celebrating your wins and watching you claim your Nutritional Freedom with a big smile on my face. Thank you for taking that first step and considering investing in your best self, your healthiest and most fulfilled self. We can’t follow through with what we don’t fully understand. Our #1 goal with coaching is to put ourselves out of business. We WANT to give you all the information you need to be successful, so much so that you don’t need a coach anymore. We want to give you all the information you need to have a nutritional plan that works for you for the next 10, 20, 30+ years. All of our coaches have been under the tutelage of Zach for the last 8 months. All three of our hand selected coaches are well versed in Flexible Dieting and recognize that each client is a unique individual with his or her own needs and goals. When you become a part of the coaching program, you are becoming a part of the FDL Family. We strive to provide every member of this community with Nutritional Freedom- a sustainable and balanced approach to nutrition and relationship with food. We recognize the stresses that each person has to face on a day-to-day basis and empathize with those. It’s our mission to teach each client how to have their nutrition meet them where they are add in the life – to add to their quality of life rather than take away. There is so much misinformation in the nutrition and fitness space today. Many diets just talk about what you can and CANNOT have. There’s a lot of fear mongering and laundry list of restrictions and taboo food items. FDL Coaching focuses on an 80/20 approach, where 80% of your food comes from whole, minimally process, high quality food sources while 20% are your more processed “cheat foods”, the foods that really bring you enjoyment. We truly feel that this balanced approach, combined with our incredible recipes, will give you the “Nutritional Freedom” most are seeking. Our coaching program certainly doesn’t have as many coaches or as many clients as some other programs in the industry. But we take great pride in that. We have carefully chosen our coaches and have an extremely selective clientele screening process. At FDL, we are a family and we take that seriously. We only want the best and tremendous success for those who work with us and we will never jeopardize bringing on mass amounts or people or anyone who is not a fit just to turn a profit. Unique from any other nutritional program out there, we have a world class, macro friendly recipe database to which you’ll gain access. We have the ability to specifically tailor our recipes to our clients. So it doesn’t matter your goal or your current macros, we will ensure that you are getting a chance to enjoy the foods that you love. If you are interested in getting started with us, fill out our application in its entirety. Our coaching staff will then receive and review it. We are only taking a handful of clients at a time! No one does coaching quite like us and our volume is always extremely high. So if you are someone who is not only extremely motivated but also fits our criteria, will we then match you with a coach. If your application is approved, our team will be in touch to have a brief phone conversation with you. This will ensure that you are committed to get only the best results! After the phone interview, you will hear back from us in a 24 hour period whether you have been accepted into the program. If you have, you will received a link to process payment and get matched with your coach! After payment, your coach will reach out for an introduction and lay out their expectation for your time together. Weekly check-ins with your coach are mandatory. You have access to your coach via email at any time. We have at most a 24 hour response time. Use your coach as the excellent resource they are! We require a minimum of 3 months of commitment from you because we truly believe that this is a great frame of time to both education and produce results with you. With your best effort, these 3 months have the ability to set you up for success for the rest of your life. Jordyn has battled with her relationship with food her whole life. At a young age Jordyn was a competitive athlete; she found purpose and passion in it. But when a spine injury ended her gymnast career at 16, she felt so lost. Unfortunately a string of poor influences made Jordyn fear food and dread weight gain as a result of her change in activity level. Her changed in lifestyle forced serious mental shift focus purely on physique goals. At 17, Jordyn dedicated herself to the gym and to restrictive nutrition practice. 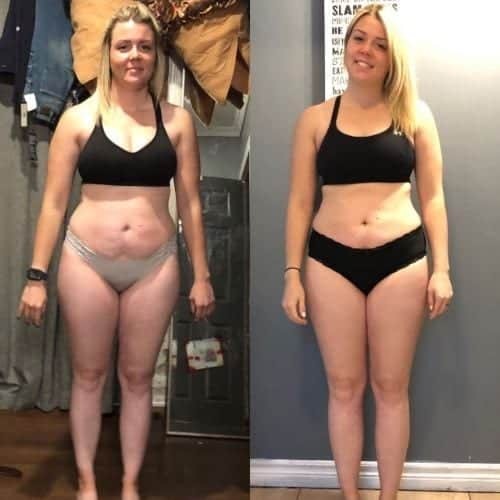 Even with a tall 5’7 frame, she went from 130 lbs to 85 lbs and was ashamed of how she looked. Since this time, Jordyn has learned about her trigger and truly devoted herself to self care, balance and a Nutritional Freedom that fits her lifestyle. Under Zach’s mentor-ship, Jordyn has taken her coaching ability to the next level and is ready to serve her clients with a wealth of knowledge and compassion. Eric journey to find Nutritional Freedom started super young. He was considered the “fat kid” and always felt like he didn’t fit in with his group of friends. This constant bullying pushed him to his breaking point where he struggled the next 6 years with periods of extreme restriction and all out binges. This whole time period he was gaining and losing 40-60 pounds but nothing was sustainable… Until he found The Flexible Dieting Lifestyle. Flash forward to today, Eric is a beast! By finding Flexible Dieting and educating himself, Eric was able to create and maintain the results he had always wanted. Today, Eric’s relationship with food is amazing and no longer needs to y o-yo diet anymore! Food is no longer in control. He is! Eric truly has a passion for nutrition and with intense study and training with FDL coaching staff he is equipped with every tool to teach others how to take control of their nutrition and no longer have to deal with yo-yo dieting! How have you enjoyed the coaching experience thus far? “Using the word “enjoy” would be a gross misrepresentation of how amazing this program has been for me. I was not in a good place with food or with my body to the point that I had vilified food and was punishing my body because of how warped my own perception became of what a great physique should be. I appreciate the coaches’ patience with me and allowing me to take baby steps when we began the process. In the beginning I felt really overwhelmed because I had no clue how to track macros but she was there with me coaching and teaching every step of the way. Week by week they challenged me to incorporate new things into my diet be it veggies or a carb source, make a new recipe from the FDL 5.0, and increased my macros at a pace that allowed me to ease into my new found freedom. The fact that they challenged me to do the research on my own has been a huge benefit because before I had a meal plan that was dictated to me so I just did as I was told and never strayed from the program. Being free to chose the things that I wanted to eat almost seemed like a foreign concept which is crazy when you think about it. Even though I still worry about what I eat and feel guilty from time to time for indulging in a simple pleasure, I am on an amazing journey to reclaiming my life back from the dark place that it once was. This is a process and mentality shift doesn’t happen over night but the fact that it has shifted even in the slightest is a vast improvement. If you could highlight your favorite part of this experience thus far, what would it be?